Merkozy: Athens's Blackmail Must End! On the eve of the European Council meeting on January 30 a rumour of a German proposal emerged Greece to submit its budget sovereignty to an EU Commissioner, as a condition to receive the second bailout. 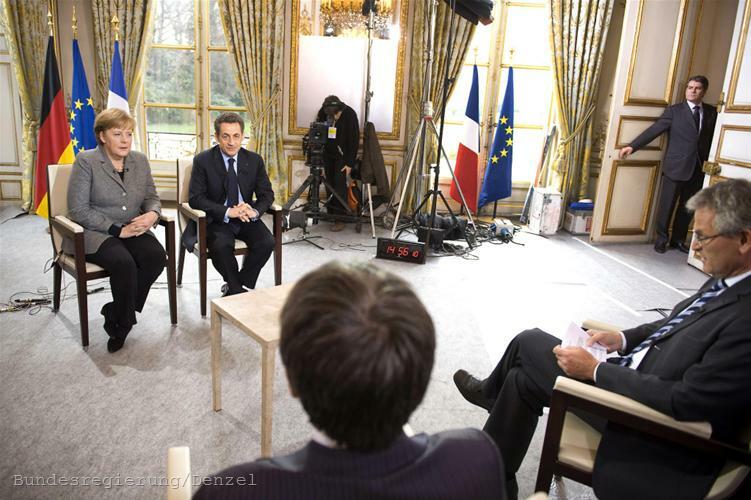 The proposal provoked strong reactions and was eventually swept under the carpet - until Monday, February 6, when the Merkozy duo (Angela Merkel and Nicolas Sarkozy) officialised it in a joint interview. The leaders of France and Germany Angela Merkel and Nicolas Sarkozy said that if Greece wanted to get a second bailout it had to collect all the revenues in a special escrow account so as to guarantee its debt payments. Indeed, the prioritisation of debt payments is the first point of the proposal mentioned above, although it remained shaded by the far more "spicy" idea for a budget commissioner. Here's how the proposal is formulated, according to the text published by The Financial Times. "Greece has to legally commit itself to giving absolute priority to future debt service. This commitment has to be legally enshrined by the Greek Parliament. State revenues are to be used first and foremost for debt service, only any remaining revenue may be used to finance primary expenditure. This will reassure public and private creditors that the Hellenic Republic will honour its commitments after PSI [Private Sector Involvement] and will positively influence market access. De facto elimination of the possibility of a default would make the threat of a non-disbursement of a GRC II tranche much more credible. If a future tranche is not disbursed, Greece can not threaten its lenders with a default, but will instead have to accept further cuts in primary expenditures as the only possible consequence of any non-disbursement." Previous attempts of the EU and the IMF to force Greece to honour its commitments and to implement promised reforms by threatening that they would not release another tranche of the 110 billion euros loan proved to be unsuccessful. Greece always comes out with a counter threat of default and always receives money from its creditors, without fulfilling its part of the deal. So now obviously the goal is to avoid that possibility of blackmail, ensuring the debt payments. If Greece does not fulfil its commitments and thus it does nor receive a future tranche, it will be entirely at the expense of its own budget. Ultimately, though not so bluntly as the proposal for a Budget Commissioner, this idea deprives Athens from its budgetary sovereignty too as it states unambiguously its fiscal priorities. The topic was discussed in detail in the latest edition of euOUTside. 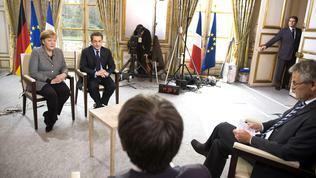 As French President Nicolas Sarkozy said in his joint interview with Angela Merkel - "they have no choice." If Greece does not receive the second bailout default is only a few days away. Apparently, however, the creditors also have little choice if they want to avoid pouring more money into a bottomless barrel. According to The Financial Times, the proposal enjoys the support of the European Commission. Luxembourg Prime Minister and Eurogroup President Jean-Claude Juncker has also expressed his approval. In order to obtain the second rescue loan, Athens must complete the deal with private lenders for partial write off of its debt and accept the terms of the Troika (new budget cuts, public job cuts, and structural reforms). For Wednesday (8 February) a meeting of eurozone finance ministers is scheduled to approve a second Greek bailout, if the above conditions are met. According to the latest estimates by 2014 the country will require funding of 145 billion euros. Our Western partners, our European cousins, notably the Germanic Nordic ones, got a taste for ridiculing Greeks. Assassinating the modern-Greek National character they did a lot of, on the back of the FYRoM - Greece Name Dispute but have continued in the hope they can change the Greek into something Germanic...in his governance and in his work-ethic. But what did Angela Merkel actually achieve, casting Greece and modern Greeks as lazy cheating Europeans in comparison to the hard-working Industrious Northern Europeans ??? That Germany has started something in Europe that will eventually be her Nemesis is a true statement to make, for Angela Merkel has awoken something in Greeks and in other Europeans that highlight the problems the German model for running the European Union has...it only really benefits Germany and the core countries that surround it. Peripheral countrys's, detached from the central structures geographically and economically suffer the consequencies from a downturn in world economic activity, who's then weak ecomonies become the targets of the ratings agencies and the banking fraternity. That Germany treated Greece first, and then Italy with disdain and disrespect was spotted in Europe as sign of growing Germanic Arrogance which has managed to relegate the Greco-Romans downwards, back down in hirarchy terms to a time when the Germanics were ruling, and in charge of a much earlier and older European Union, until that is, when the Byzantines awoke and decided to put the Germanics back in their place. Greece should make moves to re-ignite the Interest in a Mediteranean Union...this needs to be re-looked at. A Union of Mediteranean countries to compete with the Northern mainly Germanic countries of Europe. If such a Union were to exist, it is sure to attract others into the fold and it would certainly kill-off Angela Merkels vision of a Germanic Europe, the one we currently have right now where only the core Germanic countries prosper. The Slavic countries would then replace the so called PIIGS, so graciously named and depicted that way in the mainly Anglo-Saxon Germanic press! Angela Merkel prolonged the agony and sent out the wrong signals to the banking fraternity by keeping the focus on Greece and how lazy Greeks were. This anti-Greeks action shall go down in history! Germany benefitted financially by keeping Greece in the spotlight, for as long as Greece was the Target of the ratings agencies and the banking fraternity Germay reaped the benefits from a Low Euro. Germany cant lead Europe...it is too Selfish for that. Greece to Germany: Get Out More and Meet the Neighbours! When the Germanic Press and Media sufficiently demonized Greece and the Greek-Hellenic peoples...Polls were conducted in areas where anti-Greek sentiments were rife, in (i) Turkic areas and (ii) in other areas where the final result would predictably log an anti-Hellenic vote. Clever these Japanese...I mean, Germans! Now that the boot is on the other foot in terms of bad Press, Germany is being Illustrated and depicted as that Arrogant Krout, that Fritz character we all learned to despise during the WWII years. Germany is being cast as the bad guy in the European Press and International Media...the Germanic National Character is being demonized similar to the way the Germanic press treated Greece and the Greeks. So what did those Arrogant Krouts in the Merkel Regime and in the Germanic Press and Media actually achieve ??? Looks like the Germans should get out more to meet the neighbours, to find out exactly what their neighbours, their European cousins and the outside world actually think about them. If a European-Wide Poll was conducted Now, on the basis of who is the more likeable, Greece or Germany...Greeks or Germans, I wonder what that result would glean ? I would say the Greeks would win that Poll on the basis, the Greeks are more likeable than the Germans, in Europe and in the International arena...that is why the World has turned against Germany! The Germanic code of conduct and Way of Life is to have us all strapped-up, wired-in just like a battery to their system and to their work-ethic which dictates our ultimate loyalties are to service the Industrialist in his endeavours to maximize (i) efficiency,(ii) productivity and (iii) at the least possible cost to himself. In essence, the German becomes a Battery, switched on only when required to press those buttons and push those levers 100 times today and 102 times tomorrow, all in the name of Germanic efficiency and productivity, all of it, at the least possible cost to Fritz the Industrialist. The German has No life, he is a Battery, right! The Greek code of conduct and Way of Life is to have Freedom and Randomness govern our ultimate future...where Greeks end-up is usually always due to their own hard-work and endeavours. Evidenced in the successes of external Greeks in the diasporas. The Greeks know how to live, how to enjoy the pleasures of life. Greece shackled itself into a system where Greeks seemingly have lost their ability to shine, to go forward and to prosper, but only inside their own National borders. Greeks outside of Greece continue to Rock and Roll...that is why nobody can tame the unruly Greeks, to make them more like Celto-Germanics in the way that they live their lives. Greeks are sufficiently connected outside of Greece, in the International arena to ensure the Survival of their own unique Greek Way of Life...Those who seek to change the Greeks inside Greece do so at their own risk and at their own expense. Being Greek is a Way of Life...there is a time an place for everything! Being German is like being a Battery...there is a time to get switched-on, and a time to get switched-off, and thats it!